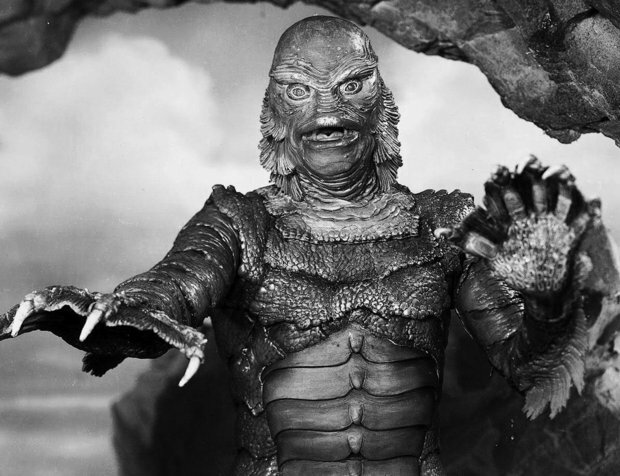 Universal International gave us “The Creature from the Black Lagoon” (1954), one of the most famous ’50s. monster films. In the first “Creature” film, Julie Adams is torn between loyalty to (Richard Denning) and the scientist she loves (Richard Carlson). However in the sequel Lori Nelson is cast as the leading lady in, “Revenge of the Creature” (1955). When she isn’t studying the Creature at an aquatic park in Florida, she is romancing John Agar. The Creature from the Black Lagoon was one of the film’s made as part of the 3D craze from Hollywood in the early fifties. However, unlike many of those film’s that were made in the format over those two years, this one has become regarded as a classic of its type. The amount of sympathy garnered for “Gill-Man” is helped enormously by the illogical actions of the humans; who in turn go diving and swimming where legend has it men get eaten! Under Arnold’s direction, atmosphere and unease is built up by talk and sightings of the Black Lagoon-and only initial glimpses of the creature’s scaly webbed claw; accompanied by the attention grabbing theme music. When the creature finally reveals itself it doesn’t disappoint for its an impressive creation. This Half-man/ Half-fish creature is covered in scales, resplendent with gills and with cold, dark featureless eyes. It also has great characteristics with a distinctive swimming style in the water, and a lumbering Frankenstein thing going on when on the land. A classic film monster.The film has wonderful underwater shots and the shadow and light work down in the depths is memorably mood enhancing. Then there’s of course the definitive sequence, the underwater flirting as “Gill-Man” swims below the shapely form of Kay, beguiled by her, it’s love at first sight. Two sequels would follow, Arnold would return for Revenge Of The Creature in 1955 and then the John Sherwood directed The Creature Walks Among Us which rounded off the trilogy in 1956. The film holds up as well as any modern classic.